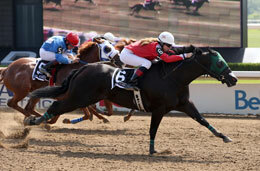 Fastest qualifier Mitford, under jockey Cassandra Jeschke, winning the Picov Maturity at Ajax Downs Sunday afternoon. AJAX, ONT�JUNE 29, 2014�Fastest qualifier Mitford returned Sunday afternoon to defeat What Ta Wear by half-a-length in the $75,835(US) Picov Maturity at Ajax Downs. First Down The Track finished a head back in the show position. Racing for owner John Wilson, Mitford completed the 350 yards in a quick :17.460 seconds, a 106 speed index, to pickup the winner's purse of $26,703(US) and increase his lifetime mark to nearly $82,000. Cassandra Jeschke rode the IVORY JAMES gelding for trainer Scott Reid. Bobby D. Cox bred the six-time winner in Texas from the Ronas Ryon mare Fitting Celebration. Renee Wilson's owned-and-trained What Ta Wear picked up $16,164(US) for her second place effort. Daniel Rose had the riding assignment. Sandra Laszlo bred the earner of $74,527. Multiple stakes winner First Down The Track earned $6,676(US) for owners Richard Wincikaby and DK Training Centre. Kim Ito trains the Lance Robinson and Max Anderson Utah bred. Completing the field were Varsity Lace, McM Tres Episode, Not Looking To Shake and A Plain Brown Rapper. Memories Time Six, One Kool Wave and Tsunami 09 were scratched. Editors note: A photo of the race will be posted when it becomes available from the track photographer.